Nag Champa incense. Mostly I hate stinky things, but this mild Indian incense washes over me in tidal waves of memories of living in Capitola 20 years ago (can it be that long…?) Bean even liked it, as we put it in the kitchen window and the summer breeze carried it away in fragrant whisps. Finding new areas of my town that I didn’t know about. After my midterms, I had to run an errand, and found myself in a new old neighborhood- and it was fun to drive around and see what it was about. Iced peppermint tea sweetened with honey. Oh mercy. Cloth grocery bags. I’ve been using them since 1989. Did you know that? I still have some of my original ones, and the girls at the market have complimented me on my awesome bags. They go back to my teenage years in Santa Cruz when I worked at Staff of Life. Doctor Bronners soap. Any flavor will do, but peppermind and almond are my favs. Put a little in a squirt bottle with some water, and it’s all I use to clean my counters. Smells good, low waste. You can kill aphids on your roses with it too. Fuchs toothbrushes. (made in Germany, pronounced FOX) Been using them for years- recycled plastic, and natural bristles. I love the way they feel. And while you’re at it, add some anise or Silly Strawberry toothpaste from Tom’s to make me really happy. Also, Burt’s Bees grapefruit shampoo. Makes your hair SO shiny, and has no pthalates or sulfates. Smells nice too. I wish my center were more in that direction. I was raised in a household where buying anything but the cheapest option was a carnal sin, that’s a hard upbringing to overcome sometimes. I love Dr. Bronner’s peppermint soap and flour sack towels, too. I found myself turning into a semi-hippie when I lived by the Bay. It’s so easy there because everything is so available. Here, back in Utah it takes a bit more work and looking around. I love my canvas grocery bags. They make me happy for so many reasons. I’ll have to keep an eye open for the No Miss polish. I love bright polish for my toenails. 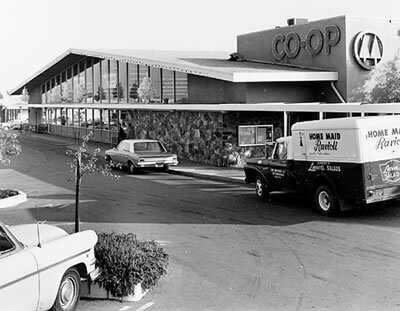 Is that the CO-OP where 24 Hr. nautaulis is now? I loved that place! Yup! Isn’t that a cool shot? I loved that store so much when I was a kid. I meant to ask these when you first posted the chai recipe: what do I sub for the black tea and what ratio of chai to soymilk? Lurve me some Rooibos tea made strong and with soymilk. Chai sounds divine. I will have to google Bronner soap. Reading this post makes me want to peruse my Moosewood cookbook collection and subject the carnivores to a week or two of veggie-ism. You can sub roobios tea, or just leave it out. The ratio is dependent on your taste- I like a lot of milk- so half and half maybe? but I have friends how take it straight. No right answer. Raindrops on roses and whiskers on kittens! What an awesome post Tracy. The chai recipe sounds divine, we will be sure to give it a go. And, I love, love , LOVE Dr. Bronners but never thought to put it in a spray bottle – brilliant! My proud moment of the week was when the checker at my co-op thought my bags were brand new because of how neatly they were folded. When I told her they were at least 4+ years old she was impressed. I look forward to getting to use them for years and years (well and the bags support employee ownership which I’m totally a fan of from my days at my old job). Haha! I haven’t thought of Dr. Bronner’s in years! When I was a teenager we would read the whole label and think, this guy’s a trip! 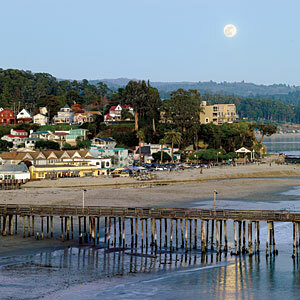 I never knew you lived in Capitola – a favorite place. My, you are such a “little hippie” Tracy! I’m in the Bay Area right now and wallowing all things wonderful! How many gallons of paint does it take to paint those toes? All One! Always toward the heart! In 9 minutes you are clean, refreshed, and ready to help the whole human race learn the ABC’s of unity! Man, that soap is a wonder. Thanks for bringing back some great memories. I love me some flour sack towels too. They’re the best for covering dough and rolling up a pumpkin roll.